Our perception of Ebola here in Europe has relaxed slightly in the last couple of months. As Guinea Conakry, Sierra Leone and Liberia fight tooth and nail to bring the outbreak under control, the few cases that have arrived here have barely spread, and the media has found other things to focus on. While the three most affected countries are still battling against the deadly disease, from here, it seems almost like a memory. The reality is far from that; the death rate is now at 8,371 people across the three hardest-hit countries. Ebola has had such a devastating effect on these countries for a series of reasons, the main factors being virtually non-existent health systems (Guinea has only 1 doctor for every 10,000 people) and extreme poverty (over half of Sierra Leone lives on less than $1.25 per day). However, with even the smallest improvement in conditions, the outbreak has been contained in other countries. In Mali, just 8 people have been infected. 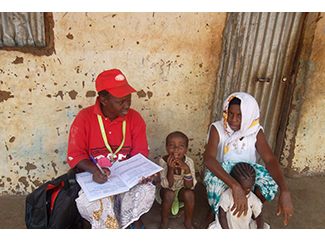 In Senegal, only one person has been reported to have contracted the illness, and they survived. While the world held its breath, Nigeria also managed to avoid outbreak in its largest city, Lagos. In amongst all of these countries lies Guinea Bissau. Located between Guinea Conakry and Senegal, the tiny nation is among the poorest in the world. The World Health Organisation (WHO) has classified it as a high-risk country for being severely impacted by Ebola, however to date the illness has not crossed its borders. 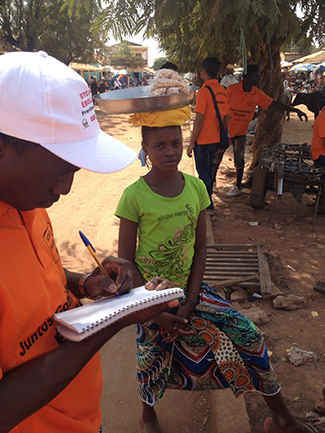 In country partner ADPP-Guinea-Bissau is working alongside communities in to prepare in the case that it does arrive. Guinea Bissau’s best, and perhaps only, chance at avoiding the human catastrophe that has occurred in the neighbouring Guinea Conakry is if the community is prepared for it. Yesterday, WHO released a report analysing the world’s response to the outbreak. Looking towards this year, it highlights the need for active surveillance and preparation in high-risk countries. In addition to running public awareness campaigns in existing Farmers Club projects since the outbreak was declared, Humana’s in-country partner ADPP has launched a community outreach program in the Gabu province and Baloma Bijagós Archipelago. Gabu shares a 500km border with Guinea Conakry, and fishermen from the neighbouring country often sell their catch in Baloma. ADPP has an established disease-prevention model, where local “activists” are trained in what the disease involves and how to prevent it. Their mission is to make sure people know what Ebola is, what is looks like, how to prevent it and what to do if someone thinks they might have it. This week, local activists completed their training program and the Ebola Corps will be out in the community on Monday. The team consists of 45 field workers and 5 coordinators who will reach out to a total of 280,000 people across the two regions over the course of six months. They will work with local leaders to organize community events and clean-up activities, as well as go door-to-door building relationships and providing information to men and women on how to keep their families safe.